Community Three Development withdrew its application for 1922 Third Street. As we wrote before, the developer proposed renovating and expanding the historic main house, renovating the historic carriage house, and constructing a new townhouse on the south side of the lot. The proposal was set to go before the Historic Preservation Review Board last Thursday, but the developer, while at the meeting, withdrew his proposal and the board ended discussion on it. In preparation for the board meeting, the Historic Preservation Office issued this staff report critiquing the proposal from a historic preservation standpoint. 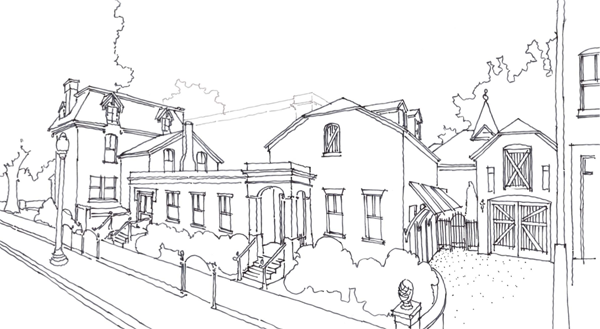 One of the most significant suggestions was that the developer remove the “hyphen” section connecting the main house with the proposed townhouse, a concept alteration that would require a zoning variance. Receiving a zoning variance is by design a costly and protracted process that’s not guaranteed to succeed. In an email to us, the developer stated that due to these various issues, ranging from some neighborhood opposition to unresolved zoning issues, they could not proceed with their plan. [T]he economic and physical constraints inherent in the redevelopment of this site require all participants to contribute to a solution that benefits the greater whole, and in this case, we unfortunately found that certain stakeholders were unwilling to do so. We will potentially revisit this project when local pressures realign, but it may be very difficult for progress while these differences remain irreconcilable. Through this process, we were surprised to the degree to which the developer reduced his ambitions, but ultimately the business of housing is a business driven by public tastes, local regulation, construction methods, and— above all— economics. If a proposal is financially impractical, it will not get built, unless it is built at a loss as a pet project of a wealthy financier. Somebody will eventually buy the house, though maybe not soon. For it to remain a single-family house, as many want it, a potential owner must be able to afford replacing the roof, gutting the interior, building a new kitchen and bathrooms, replacing the wiring, replacing the plumbing, installing insulation, replacing many of the floors, installing a new furnace, replacing much of the drywall, fixing the foundation, and repairing the carriage house— renovations that will likely run near a million dollars, if not more, on top of the sale price. A condo project with fewer units (and without a townhouse) could still succeed, but the reduced number of units will likely exclude an affordable housing component (only required of projects with 10 or more units). Furthermore, those fewer units will have to be sold at higher prices to justify the renovation costs. The neighborhood opposition (far from universal, mind you) unwittingly set a new entry criterion for purchasing the property: if you want to live at 1922 Third Street, you must be a very wealthy person. What do you think? Are you glad or are you disappointed that the proposal was withdrawn? 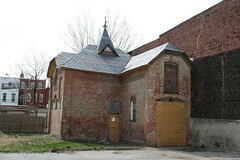 In the last round of concept changes for 1922 Third Street, the developer proposed restoring an old wall (pictured above) attached to the carriage house. The developer added it after we discovered an 1880 architectural pattern book produced by James McGill, the architect of LeDroit Park’s original and eclectic houses. Google, in its effort to scan and publish old, public-domain documents, scanned the pattern book and posted it online. You will notice engravings of several other houses that still stand in LeDroit Park today. We have recreated a 3D model of the carriage house based on James McGill’s original design. We had to guess the colors since the McGill publication was printed as a simple black-and-white engraving. Download the Google SketchUp file (get SketchUp for free to view it) or watch the video tour below. Unlike today’s garages, these carriage houses were designed to house a carriage or two, several horses, and bales of hay. Modern cars, once fondly called “horseless carriages”, obviate need for these equine accouterments and the developer wishes to convert the carriage house into living quarters. The problem is that the zoning code is more accepting of car housing than of people housing; converting an old carriage house into living quarters will require a zoning variance. Whatever gets built at the site, be it through this developer or another, would ideally include the restoration of the carriage house and its adaptation from housing for horses into housing for people. The design for 1922 Third Street will go before the Historic Preservation Review Board on Thursday. Interested parties may comment on the proposal either way at the hearing. On Thursday ANC1B will vote on the revised proposal for 1922 Third Street. 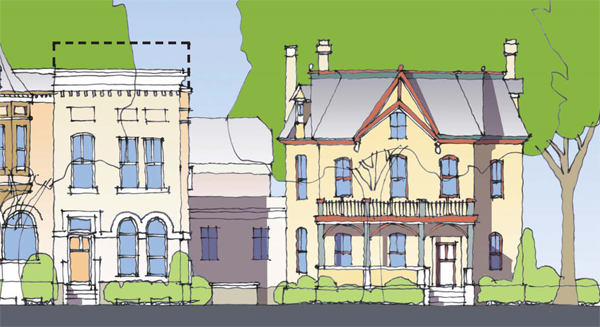 The new proposal, pictured above, modifies the scale of the proposed new townhouse (on the left). This part of the project was by far the most controversial, as the previous design (its outline dotted above) called for structure taller and much deeper than the adjacent townhouses. 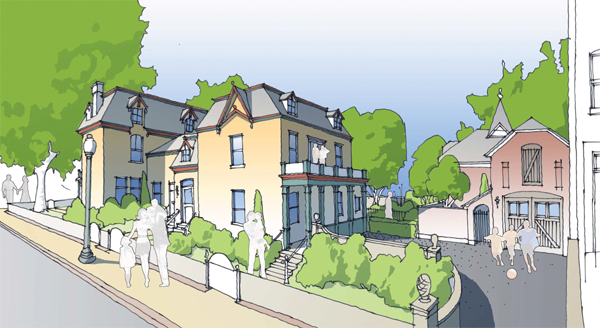 In fact this revised concept reduces the townhouse size significantly compared to the original concept (dotted below). Another nice feature is the articulation added to the side of the townhouse. 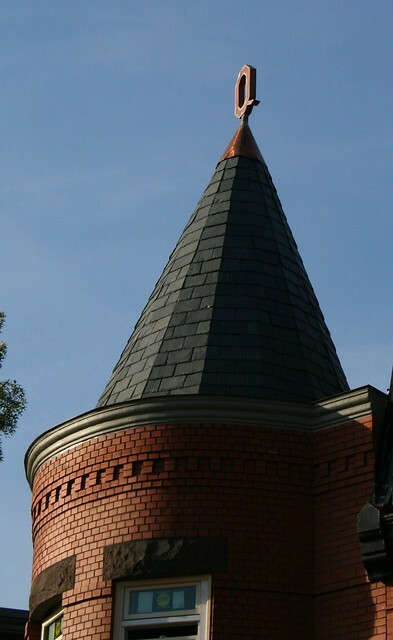 Two bays extend out from the side, as does an ornate chimney, much like others in the neighborhood. 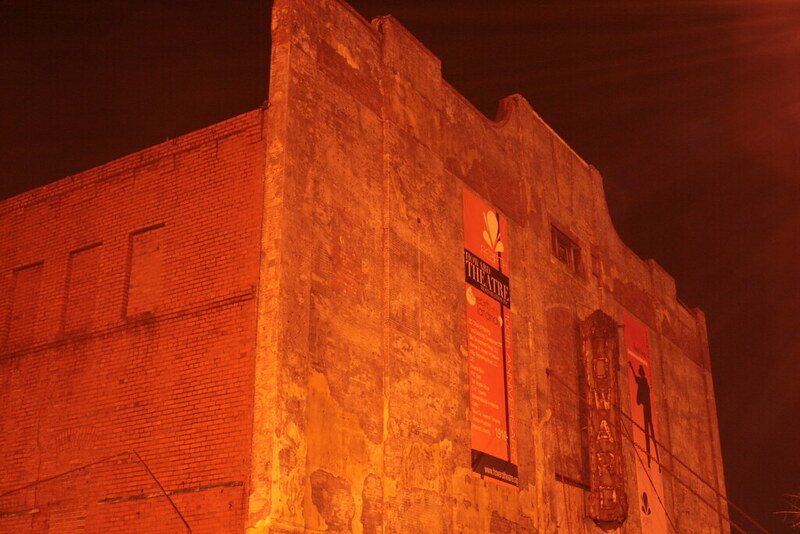 These elements combine to produce a structure less visible from the north side of the property on U Street. The developer has shortened the rear addition to allow the historic carriage house to stand out more on its own. The addition’s architectural style resembles that of the main house more closely than the previous design, which combined elements of both the main house and the carriage house. We reduced the size, footprint, height, of the townhouse portion of the plan to address concerns about the mass of this portion in the original concept. The height of the townhouse has been reduced to match the height of the neighboring property and is now below the height of the main structure. The depth of this portion has also been reduced by approximately 30 feet. Further, the profile has been revised to step down towards the rear of the site to increase light to adjacent areas. The result of these combined actions have reduced the mass of the building by almost 40% and a mass of building that is drastically smaller than what would be allowed by-right on the adjoining parcels to the south.In addition to the reduced massing, we eliminated 2 units in the townhouse portion, thereby reducing the overall number of units from 14 to 12 total units. The reduced number of units, with the provision of 4 parking spaces, has allowed for an increased parking ratio that is in line with other residential uses in the R-4 zone. This new ratio now eliminates the need for a historical parking waiver. We have articulated the side of the townhouse portion to be more compatible with the surrounding urban character and to give more visual interest to the side elevation. The addition to the main structure has been redesigned to be more compatible with the character of the existing building. In addition, this revision has allowed for greater views of the historic carriage house from all angles. We have also learned that the current front porch of the existing building is not historically accurate and we have subsequently redesigned this element to more closely resemble the historic structure’s original porch. 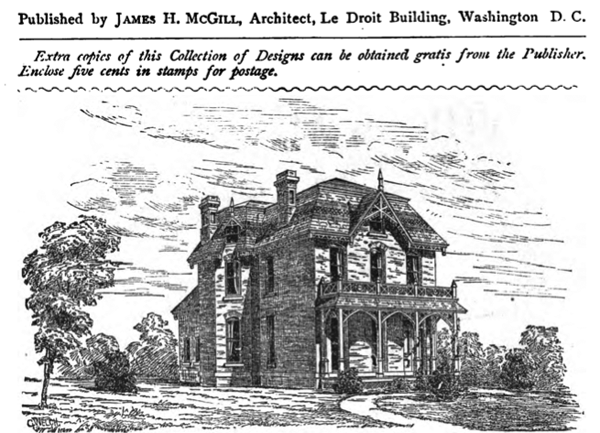 Indeed the current front porch (first image below) is inconsistent with James H. McGill’s original design published in 1880 (second image below). The developer will present this revision concept to the ANC on Thursday night at 7 pm on the second floor of the Reeves Building at 14th and U Streets. After the developer’s presentation, the commission will allow the public to ask questions (you can always frame your comment in the form of a question) and will then vote to support or to oppose the project. 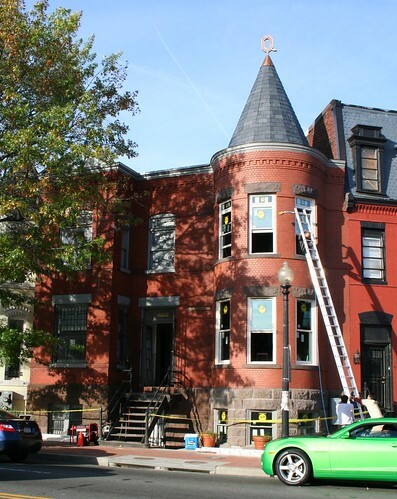 The ANC will forward its opinion to the Historic Preservation Review Board, which will hold a hearing on this revised concept on Thursday, April 22 at 10 am at One Judiciary Square (441 Fourth Street NW), Room 220 South. At Thursday’s monthly meeting of ANC1B, Grant Epstein, president of Capitol Hill-based Community Three Development, presented his proposal for 1922 Third Street, a project we wrote about a few days ago. 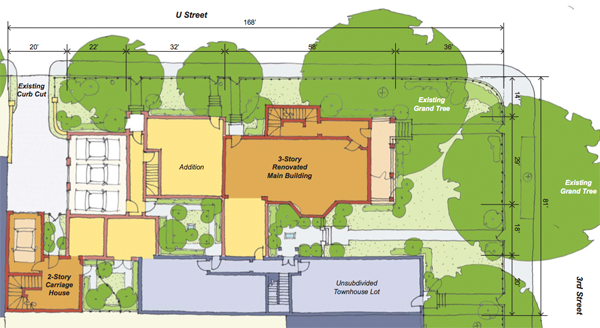 His proposal calls for renovating the main house (top right) and carriage house (bottom right) and for constructing a connecting section as well as a new townhouse. Because the lot is 13,600 square feet, the R-4 zoning code permits multi-unit apartments with the maximum number of units set to the lot area divided by 900. Although Mr. Epstein proposes 14 units, the zoning code actually permits 15 units by right (13,600 / 900 = 15.1). 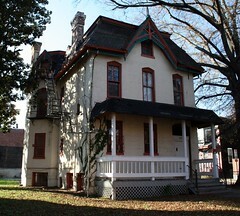 Since LeDroit Park is a historic district, most exterior renovations and all new construction within the district’s boundaries must undergo a review process that begins with the Historic Preservation Office (HPO), which is tasked with ensuring that such projects preserve, match, or enhance the historic character of the neighborhood. Ay, there’s the rub: historic character means different things to different people. Even if the standards for historic preservation are themselves nebulous, the process itself is designed with a good deal of transparency. Mr. Epstein’s proposal must be approved by the city’s Historic Preservation Review Board, which holds a public hearing during which the applicant presents the plan, the HPO staff present their report, and ANC representatives, community groups, and interested citizens may testify either way on the plan. The board then approves the project, rejects it, or approves it with conditions. Mr. Epstein stated that he has consulted with HPO staff to refine his proposal to satisfy their interpretation of historic preservation suitable for LeDroit Park. We say “their interpretation” not to be snarky, but rather to remind readers that what constitutes historically appropriate is often a subjective matter of taste and judgment. The past, much like the present, is a collection of different stories, styles, and attitudes. Sometimes there is no one right answer in preservation matters, especially in a neighborhood featuring the Victorian, Queen Anne, Italianate, Second Empire, Gothic Revival, and Spanish Colonial styles among others. At the ANC meeting and in discussions with residents, we have gleaned the following concerns in addition to many thumbs-up. 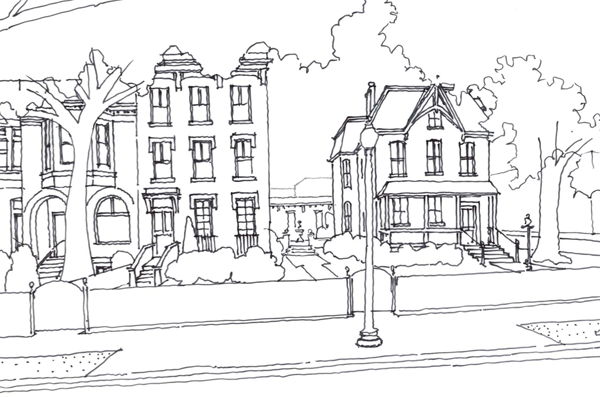 Commissioner Myla Moss (ANC1B01 – LeDroit Park), expressed concern that the proposed townhouse (the middle building in the drawing above) was too tall for the row of neighboring townhouses. Mr. Epstein replied that the added height of the building was in fact the suggestion of HPO staff. Their reasoning, Mr. Espstein stated, is that in Washington, end-unit rowhouses have typically been more prominent than the intervening houses. The prominence was typically marked by extra size, extra height, and extra ornamentation. The added height, Mr. Epstein asserted, is in keeping with an end-unit rowhouse. He also noted that many other buildings on the street are taller than what he proposes. Others expressed concern that the addition of 14 homes on the site would overwhelm the adjacent streets with parked cars since the proposal includes only four parking spaces (one in the carriage house and three in the new adjacent structure pictured above). Mr. Epstein replied that he originally proposed five spaces, but HPO staff suggested that he reduce the number to four so as not to overwhelm a historic structure with an abundance of car parking. Since fewer people owned cars back then, historic architecture is less car-obsessed than today’s buildings— notice how few driveways and garages you’ll find in Georgetown compared to any neighborhood built in the last 60 years. Mr. Epstein stated that a way to discourage new residents from owning cars was to reduce the amount of available on-site parking. There was at least one skeptical guffaw from the audience, though the reality will likely depend on a variety of factors. Mr. Epstein suspects the project will attract residents more inclined to live car-less. Commissioner Thomas Smith (ANC1B09), an architect, asked what features besides reduced on-site parking Mr. Epstein would incorporate to discourage car ownership. Mr. Epstein had none, but was open to considering bike storage and car-sharing. One resident expressed concern that converting what was once a single-family house (before it became a rooming house in the 1970s) into a multi-unit condo building could itself contradict LeDroit Park’s original intent as a country suburb of single-family homes. In response to our question, Mr. Epstein stated that he intended to follow the city’s new inclusionary zoning regulations, which would translate to one of the fourteen units being set aside for a buyer of modest means. We also noted to Mr. Epstein that though the rowhouse is intended to be an ornamental end-unit— an “exclamation mark” at the end of a row, as he put it— the side of the townhouse, as illustrated in his drawing above, lacks the adornment typical of end-unit rowhouses. Mr. Epstein stated that there was some debate on the issue, still unresolved, as to whether the side of the rowhouse should fully serve as the “exclamation mark” or serve as “canvas” upon which to view the original 1880s structure. Mr. Epstein also explained the dire condition of the house and carriage house. The main house was entirely gutted of its original interior and years of neglect have left a damaged foundation and ample mold. The carriage house (pictured at the top of this post) is itself crumbling from the weight of the recent replacement roof. Both structures require a significant investment of money to rehabilitate. The investment of money required as well as the uncertain historic review process both make the project something that Mr. Epstein says few developers would touch. As a tactical measure to postpone the HPRB’s review of the proposal, the ANC voted to oppose the concept until the developer could present his proposal to the LeDroit Park Civic Association and the ANC’s newly formed design review committee. The ANC will likely address the matter again at the April meeting. ANC1B Design Committee – Tuesday, March 16 at 6:30 pm at 733 Euclid Street NW. LeDroit Park Civic Association – Tuesday, March 23 at 7 pm at the Florida Avenue Baptist Church, 6th & Bohrer Streets. ANC1B – Thursday, April 1 at 7 pm on the second floor of the Reeves Building, 14th & U Streets. What do Duke Ellington, Ella Fitzgerald, Marvin Gaye, and Roberta Flack have in common? Their careers began at the Howard Theater. The WBJ reports that next weekend Channel 50 (WDCW) will air Howard Theatre: A Century in Song looking back at the theater’s place in Washington history and music over the past 100 years. The show’s producers have posted a photo gallery documenting what the theater looks like inside today— if you thought the outside looked trashy, the inside is worse. The show will air twice on February 27 and once on February 28. In the meantime, check out this cool time-lapse video tracking the removal of the 1940s plaster façade. If last night’s ANC meeting is any judge, the economy is picking up. 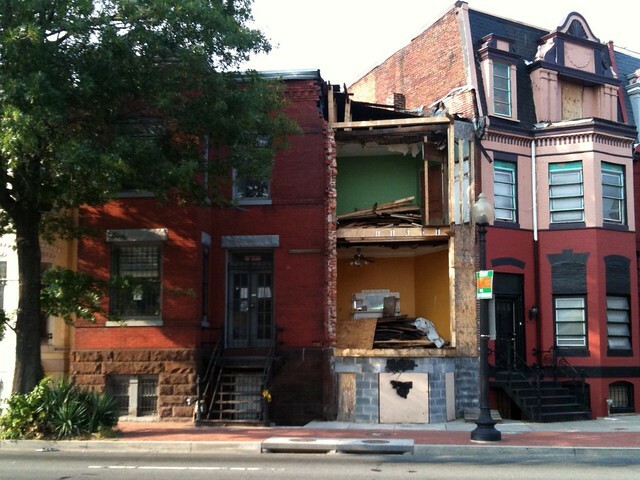 Two separate petitioners sought approval for liquor licenses for their upcoming businesses on U Street and one petitioner presented plans to renovate a vacant building into a restaurant. The colorfully-dressed owner of Marvin (2007 14th St NW) sought and received support for two minor modifications to his voluntary agreement. One amendment will allow him to keep an upstairs door open and the second will nix the requirement that he keep decibel readers in the restaurant. The latter amendment, he stressed, does not exempt Marvin from the noise restriction, but merely relieves him from having to buy expensive (and fragile) volume-measuring equipment. The newly renovated building at the northeast corner of 14th and U Streets has signed two tenants, one for the ground up and one for the basement. The proprietors of the future basement venue Cuckoo Marans (a type of hen) bill their nightclub (Retail Class C) as a “music and arts club” and envision hosting musical acts that might not be able to fill venues as large as the 9:30 Club. They added that though their business will focus primarily on music, they will feature other arts, too. The ANC voted to oppose the license as a tactical measure until the proprietors of both the upper floors and the basement could come to a voluntary agreement with the ANC. The night’s other new license petitioner, a DJ and former Smithsonian employee, presented his plans for the U Street Music Hall to be located in the basement of 1115 U Street NW (the former location of the now-shuttered Cue Bar). The venue will offer free DJ classes to elementary and middle-school kids in the afternoon and will serve as a music venue at night. The petitioner has asked for DCRA for a maximum capacity of 399 people, a number that department will likely reduce and a number at which Commissioner Brianne Nadeau balked. The petitioner is seeking the permission of ABRA to close at 4 am Friday and Saturday nights so as not to spill a crowd of drunken patrons onto the street at the city’s 3 am last call. As with Cuckoo Marans, the ANC voted to oppose the license as a tactical measure until the petitioner could come to a voluntary agreement with the ANC. At 901 U Street, across the street from Nellie’s, sits a building that has been vacant for twenty years. The petitioners presented plans to renovate the building into a restaurant and bar with a roof deck. Sitting on the elbow edge of the L’Enfant Plan, the building renovation requires approval of the Historic Preservation Review Board. The renderings, which we have not had a chance to scan yet, look pretty nice. The petitioner is hoping to secure building permits next month for a construction process that will last about four months. The ANC voted to support the petitioner’s conceptual design. 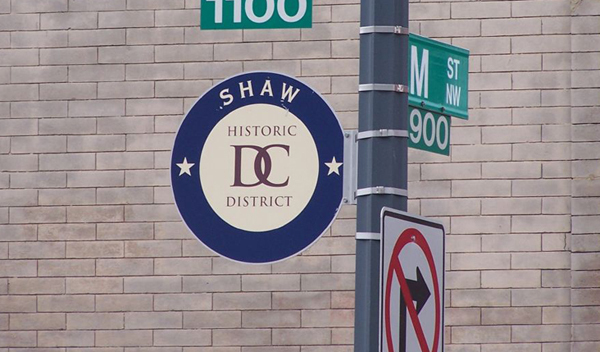 The DC Historic District markers adorning lampposts in Shaw, Anacostia, and Capitol Hill are coming to LeDroit Park— eventually. The Office of Historic Preservation informed us today that the signs, for which the office has already paid, will adorn every historic district when DDOT decides to dust them off and install them.